The Giro d’Italia’s overall favourites are planning for a classification shake up tomorrow in Le Marche. The race confronts a 54.8-kilometre time trial that could make as much as of a difference, or more, than a mountain stage like Le Tre Cime di Lavaredo. Cycling Weekly spoke with five of the top overall contenders in the last week to get their thoughts on the test. “It’s huge for the overall. I know a lot of guys have seen it and I know a lot of guys are scared of it, but it’s good for me. “It’s one of those ones you have to be good from start to finish. If you die off at the end, you’re going to lose three minutes on the final climb. “It will be a tough test and even more so demanding after a long first week. The GC will become clearer afterwards. I am focused on the best ride I can do and will assess the overall after that. There is still a lot of racing in this Giro beyond that point. “It’s long, hard and has everything. It’s technical, with a lot of climbs, big power stretches. It’s hard to say the kind of gaps between specialists and pure climbers. It took me one hour, 45 minutes to ride it in recon. It’s going to hurt. “Wiggins a favourite for the time trial, for sure, he’s the best time trial rider here at the Giro. The idea is to lose as little as possible because we have to keep it close for the mountains. “It’s especially technical with a lot of up and down riding in the beginning. The team recorded parcours, which I have seen, but not seen it live yet; that’s gonna happen on Saturday before the race. “It’s a really hard time trial. Not only is it long, but there is really not much flat involved. 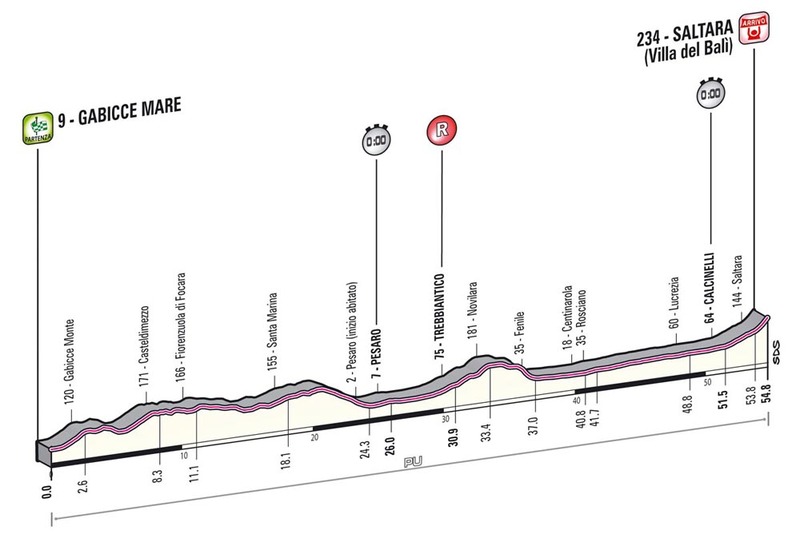 It’s going to be long at 55km, but also long in time because it’s not on particularly fast roads, and with the gradient, it’s not going to be a real fast time trial.